The week we ordered WOOP meals in, it was reassuring to know we could have dinner after work in no more than 20 minutes. On the other hand, it felt like we chose a bad week compared to other bloggers, and we would not have picked some the meals we received if we had been given a choice. 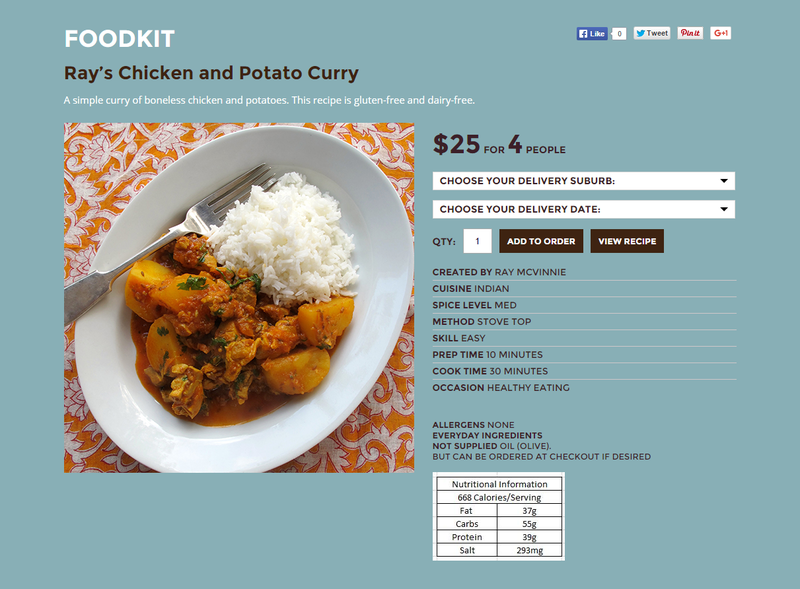 For the sake of comparison, we decided to give another meal kit delivery service a go. 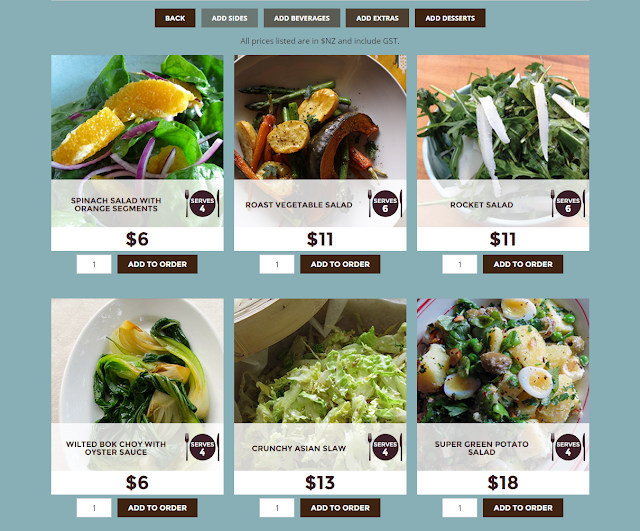 Farro Foodkits is actually quite different in that it's not based on a weekly subscription. Launched in March, the company lets you choose the meals you want, and buy just one or many of the packs. I was initially excited that I could look through the different meal kits and pick the ones that would work best for us. They were sorted into a number of different categories, and it was great to see one called "Express". 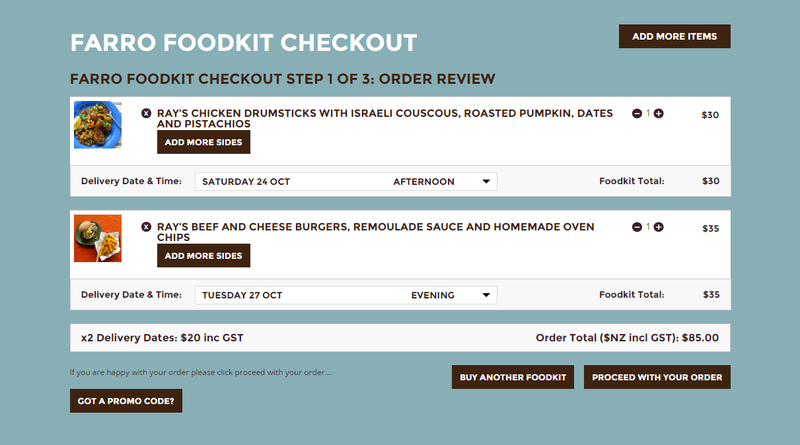 The home page also had a section showcasing featured foodkits, which have not only been designed by Masterchef judge Ray McVinnie, but also looked delicious and very affordable, at around $10 per portion. Featured foodkits for the week. It was only after I clicked through to the foodkit listings that I realised those options would take quite a long time for a midweek meal, with a prep time of 20 minutes and a cooking time of 30-35 minutes. 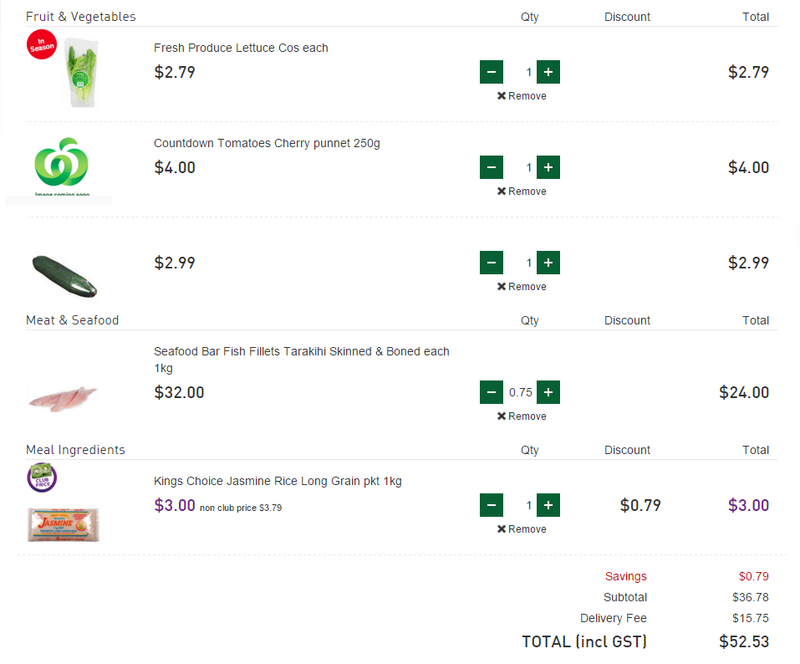 I then navigated to the Express category, which had 10 items on offer. They didn't really seem all that quick to make though, ranging from 25 minutes for Ray's Steak and Guacamole Wraps to 45 minutes for Ray's Meatball Pizza. Some meals from other categories take about the same amount of time, while other ones need you to cook the dish for an hour, on top of a 20 minute prep time. Foodkit listing from the Healthy Eating category. To be honest, I found the meal selection process to be quite draining. I wanted an ingredient delivery service to save me time, and here I was wasting plenty of it, browsing through the options. It wouldn't have been so bad if there were a way of sorting the foodkits by time required, or if I could have had an overview of what's available across all the categories instead of having to click through into each one (or I guess, if I weren't trying to optimise my choices). I started to wonder if I would be better off picking a quick recipe from the internet, and ordering the ingredients from the supermarket. Once you've decided what you want to eat, you choose a delivery date and suburb. 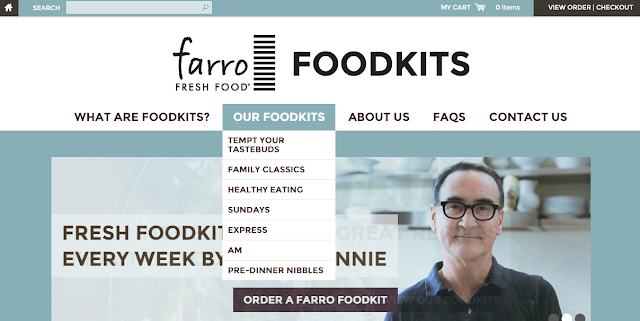 A great advantage of Farro Foodkits is that you can order for the next day, if it's between Tuesday and Saturday. You could be tempted into going overboard and ordering a pack to be delivered each day, but a $10 delivery fee shown in your shopping cart would remind you to be more reasonable. Shopping cart showing delivery fees. Another thing I liked about Farro Foodkits is that you can add sides (various salads and carbs) to your meal, along with drinks (wine) and other extras you might need (such as milk, butter, eggs, bacon, and olive oil). This means you can make sure you eat plenty of greens, as well as save a trip to the supermarket for simple grocery items. Some of the sides on offer. I realised after I ordered that we would be out on the night we were getting the food delivered, but the company was happy to put extra ice in the box for us. We took everything out when we got home and it was all still safely chilled. The meat (and icepack) was in a completely sealed silver bag, which we needed scissors to open. The rest of the ingredients were in Farro Fresh shopping bags, grouped by meal. A plastic sleeve contained a thank you letter, the recipe instructions for each food kit, and an ingredients checklist. It was then that I discovered the Balti chicken curry did not come with rice, though it wasn't an issue as we have plenty of rice on hand anyway. We decided to start with the fish meal on the assumption that it wouldn't last as long, even though it was intended for 4 people and we would end up needing several days to finish it. There was a very generous portion of fish supplied, and we were surprised that the rice was raw, given the foodkit was in the Express category. The first instruction on the recipe was, of course, to cook the rice (we cheated and used a rice cooker, which took us around 40 minutes—supposedly it takes only 25 minutes on the stovetop). Ingredients for Thai fish meal. The other thing that took a long time was preparing the cucumber for the salad. After scooping out the seeds and dicing the flesh, you let the cucumber sit in salt for 15 minutes before squeezing it dry. I had plenty to do while waiting for it though: chopping the coriander and garlic for the fish marinade, separating and cleaning the leaves of cos lettuce, chopping the peanuts, picking the mint leaves and slicing the tomatoes and limes. Chopped coriander and garlic on the fish fillets, before marinating. The only thing that was different from what you might buy yourself from the supermarket was the liquid mix, which the recipe sheet told us contained sweet chilli sauce, fish sauce and lime juice. The coriander did not come attached to the root (we got this our WOOP meal kit), so some leaves were a bit yellow, speckled and wilting, though in general, the ingredients felt fresh. We disobeyed the recipe on more than one occasion, refusing to cook the fish without salt or additional oil. We sliced the lime into wedges, rather than serving half a lime on each plate. There was so much fish we needed to cook it in three batches, and we left one batch marinating overnight for pan-frying the next day. Our rendition of Ray's Thai fish with cucumber and peanut salad. The end result? We loved the salad, which was savoury, spicy and crunchy. The fish needed salt for flavour, and I'm not sure that all the work chopping coriander and garlic improved it that much, though it does look impressive. We would prefer the fish meal we had from WOOP for its quick preparation time and beautiful tamarind flavour, but this cucumber salad is something we would definitely make again. We didn't get to Ray's Balti Chicken Curry for several days, because there was enough fish for 5 - 6 people in the previous meal, though only about the right amount of vegetables for 3 - 4. The letter accompanying the food told us to cook our meals within 3 - 4 days, so I was dismayed to discover that the free range chicken had a "best before" date only two days from the delivery date, and we were two days past it already. We decided to cook it anyway, since it smelt fine and we hate food waste. Ingredients for balti chicken curry. I'm not sure why the yoghurt came in two separate containers. I mention this because I found them difficult to open, and while trying to prise the lid off at the same time as cooking our curry, I actually made my thumb bleed (I also found it annoying I needed scissors to open the coriander and spice packets, but that's another matter). The ginger came in two pieces as well, and they looked so different (one piece was sprouting) that I thought for a moment they were different ingredients. Again, everything was pretty much as you would buy it from the supermarket, apart from the spice mix, which combined cardamom pods, chilli flakes, cinnamon and turmeric for you. Chopped ingredients for the curry. Once you've chopped the vegetables (onion, garlic, ginger, green chilli, tomato, coriander, lemon zest) and chicken thighs, the cooking part was pretty straightforward: fry the aromatics, add the chicken, then the tomato, then the yoghurt. It was fun and fascinating watching the contents of the pan change in colour, and it smelt mouth-watering too. Cooking chopped chicken thighs with vegetables and spices. The finished curry was fragrant, with the flavour of the spices brought out by the fresh ginger. We managed to get 3 meals out of the $20 kit so it was not expensive either—a great option if you have the time to prepare it. What if, for argument's sake, I already had Ray's recipes, and decided to get the ingredients from the supermarket myself? 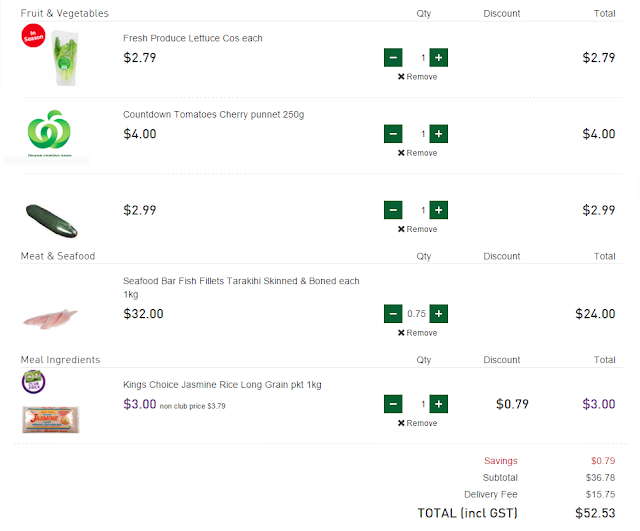 I plugged the items for the Thai style fish into Countdown's online shopping website and the total came to $75.94, including a delivery fee of $15.75. Excluding delivery, it was $60.19. The fish foodkit only cost $45, so it compares very favourably. Of course, you would end up with leftovers when you buy from the supermarket. For instance, you only need one tablespoon of fish sauce, not a whole bottle. I tried again, this time assuming you already have the sauces and garlic at home, and grow your own limes, mint and coriander. This reduced shopping cart would cost you less than the Farro Foodkit, but not by that much if you include delivery for both. Minimal shopping from supermarket for Thai style fish meal. Entering the ingredients for the chicken curry gave me a similar result, even though Countdown didn't have a free range option for the boneless chicken thigh, so I had to substitute a cheaper item. Farro Foodkits produce high-quality, inexpensive and delicious meals, but you are essentially cooking from scratch, so you need more time to prepare them than the previously reviewed WOOP dinners. If your chopping skills are not honed and sharpened, you are likely take longer than the recipe suggests too, unless you have a helper in the kitchen. The service offers more flexibility with delivery dates than I have seen elsewhere, and there is no minimum order or ongoing subscription. You do, however, need to spend time choosing what meal(s) you want, and take note of whether extra ingredients are required (e.g. rice for curry). I liked the fact that you can purchase additional salads or grocery items such as bread and milk, even though it adds extra steps to the ordering process. Also, you can reuse the recipes, because even when ingredients have been premixed, you are told how much of each component went into it. Overall, Farro Foodkits are great if you want a tasty and healthy home-cooked meal, and can spare the time and energy to prepare it. It can be cheaper and more convenient than buying ingredients from the supermarket, and you can be pretty sure the result will be good. You will have fun in the kitchen and maybe learn some things too. If only we weren't always so tired and hungry when we get home from work! What a great review! A lot of people at my work use services like this for dinner and they often have delicious leftovers for lunch. I'm quite surprised that the price difference between the Farro foodkit is not much more expensive than doing your own shopping - good investigative skills! I was surprised how reasonable the prices were too - the subscription services often cost 50% more. I guess the difference is that with a subscription service, they need to make sure they offer you something new every day, so there's a lot of work creating and testing recipes. With Farro Foodkits, on the other hand, there is already a pool of developed recipes, and there is no need to come up with a fresh one until the next season, and even then I suspect they reuse many of the old recipes. Also, with WOOP at least, they do a lot of the prep for you (premade sauces or pre-cooked rice) so there's a time and packaging cost that needs to be taken into account too. WTF is with this Foodie Question?